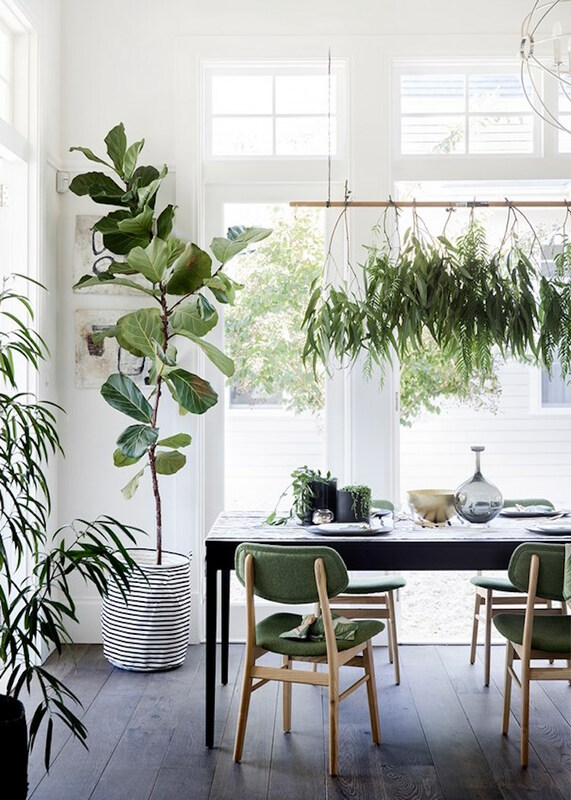 While Kendall Jenner and Kaia Gerber might be the It girls of fashion, in the interior world it's plants that are stealing the limelight! From large Palms and Fiddle Leaf Figs to smaller Chinese money plants and asparagus ferns, anything goes in the urban jungle! Last month we explored indoor climbers which have been slowly winding their away up the inside of windows across the continent. And this month I thought we could get into the swing (get it?!) of hanging plants. These guys have been hanging around (this is fun) for a while now and look set to stay! 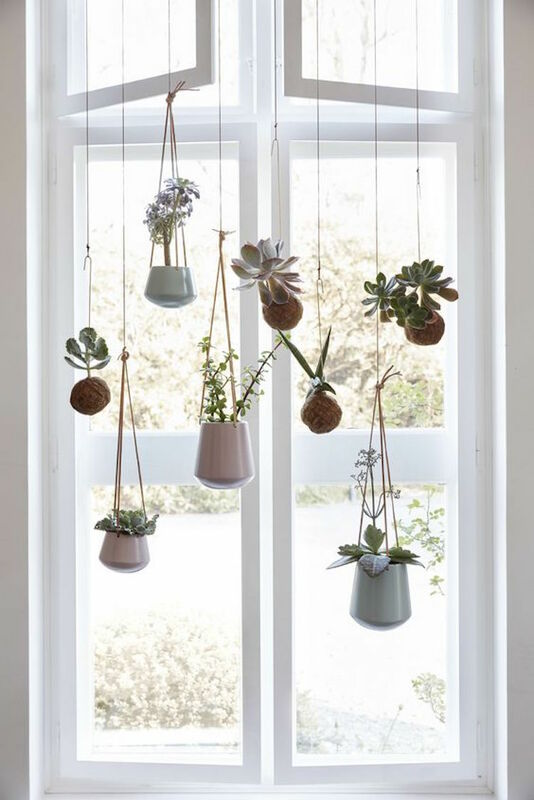 In fact, new and exciting ways to suspend your greenery to new, lofty heights are, er, on the rise! I caught up with my green-fingered friends Igor Josifovic, author of Urban Jungle: Living and Styling with Plants, Hilton Carter, who's incredibly green home I featured here and the Arctic Gardener to get the complete low down and find out more about how we can create our best hanging garden game! 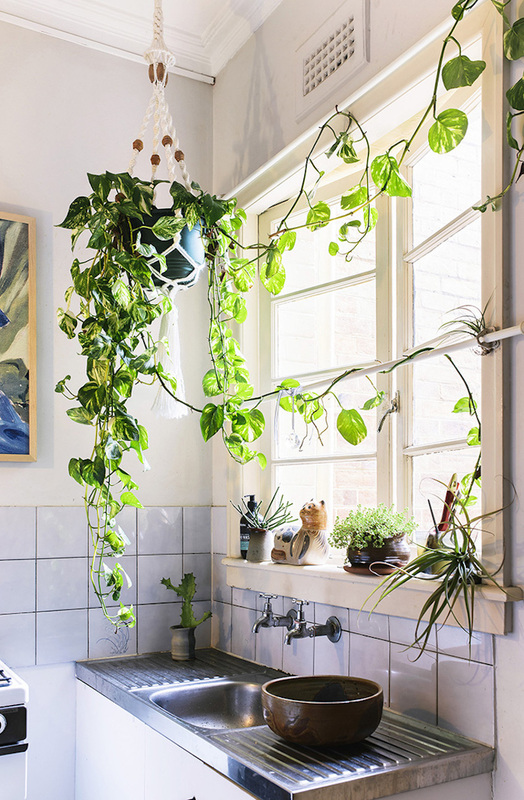 So what makes the best hanging plant? Igor advises "any trailing plant is perfect for a hanging pot as they prefer space to grow freely." * the leaves are toxic so keep away from children and pets. 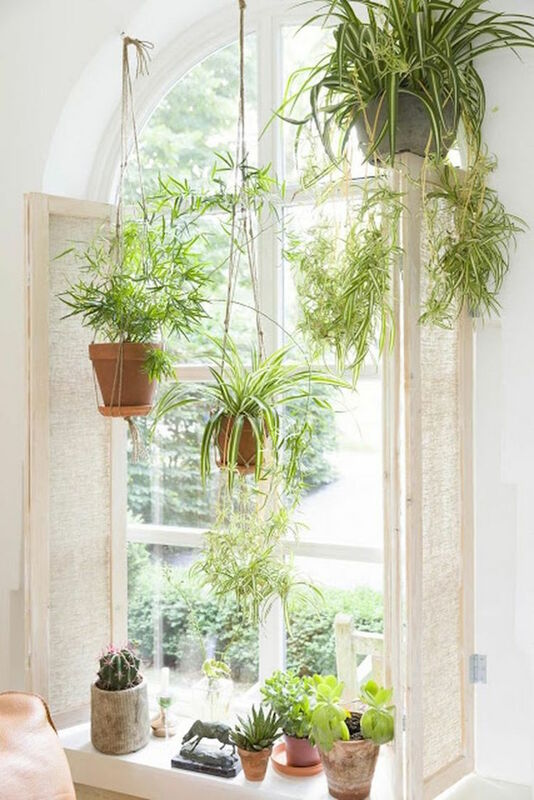 Tip: If you have a ground floor window plants make a great 'natural' screen. 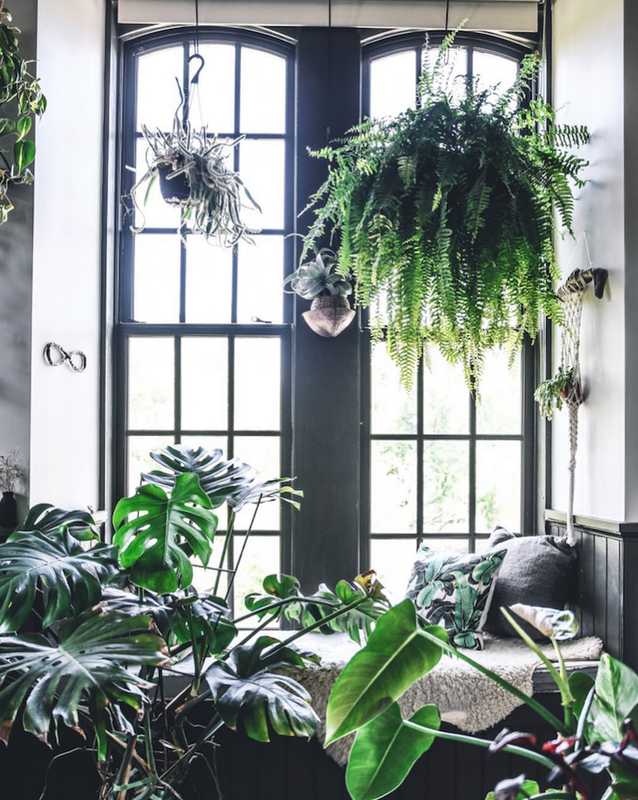 But Hilton warns "be mindful to not block too much light coming into your windows so that your other plants, sitting away from the window can still benefit." Hanging plants can be really heavy so you need a sturdy hook and a drill in order to make sure they stay up. Alternatively look for natural places to hang them in your home - like handles, knobs and ledges. They also make great table decorations. In this space there were no pots necessary as branches were simply hooked over a long cane suspended from the ceiling. The beauty of this is you can update it depending on your mood, the occasion and what you find in the garden / local flower shop! 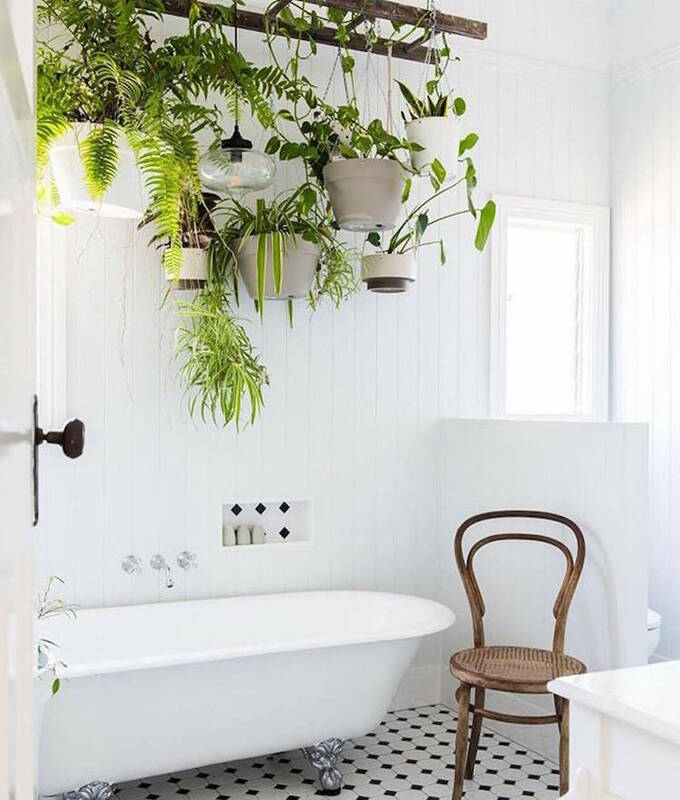 Continuing on the same theme... using a rail (or in this case, a vintage ladder) is ideal if you're looking to hang lots of plants (and add to the collection as time goes on). This also means less holes in the ceiling (in a bathroom that's always good!). For a more relaxed look it's good to use a variety of blooms. 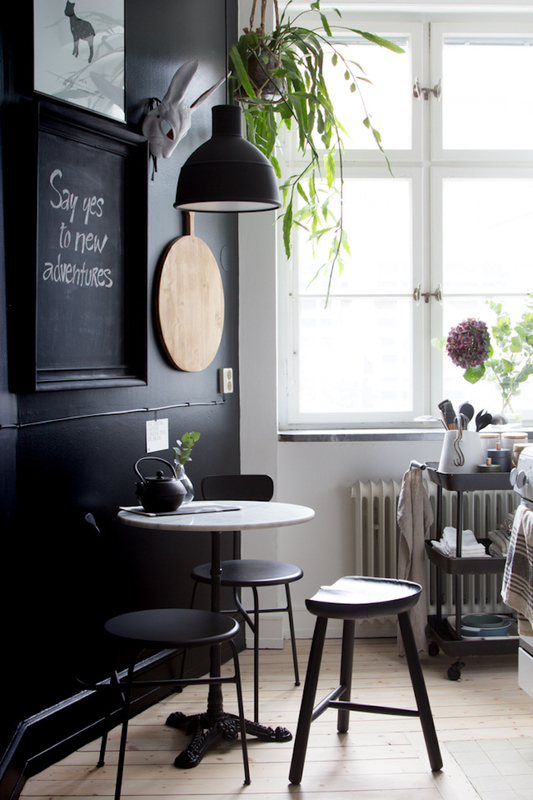 "I like to mix and match hanging planters choosing different hangers and pots as well as various lengths creating a more lively hanging garden," Igor tells me. "Of course this depends on personal preferences. 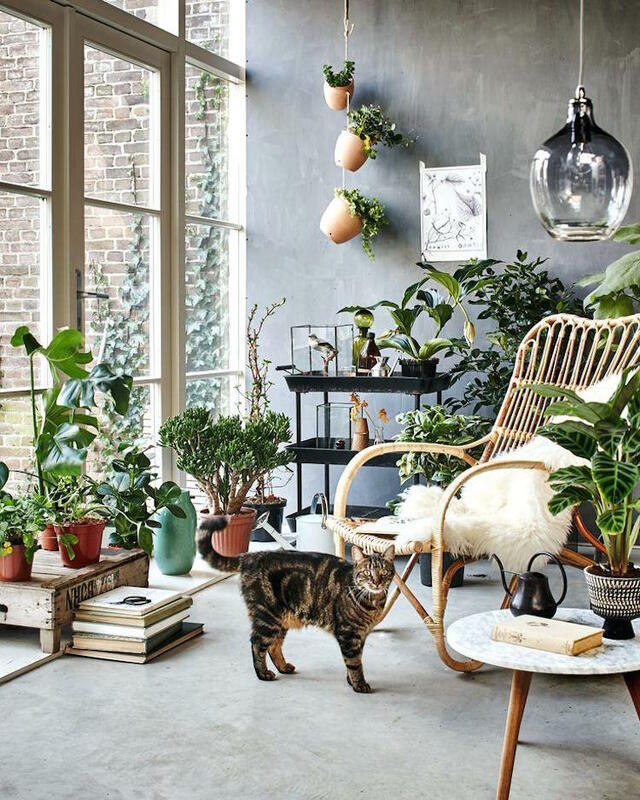 But usually I would say hanging plants look lovelier when grouped together unless you have one big hanging statement plant." As long as the plant is suitable for hanging, there are no rules to the types you group. "I like to go free and wild listening to my guts. You can get playful and pair a trailing Tradescantia with purple leaves with a green Bird's Nest fern and romantic ivy plant," enthuses Igor. 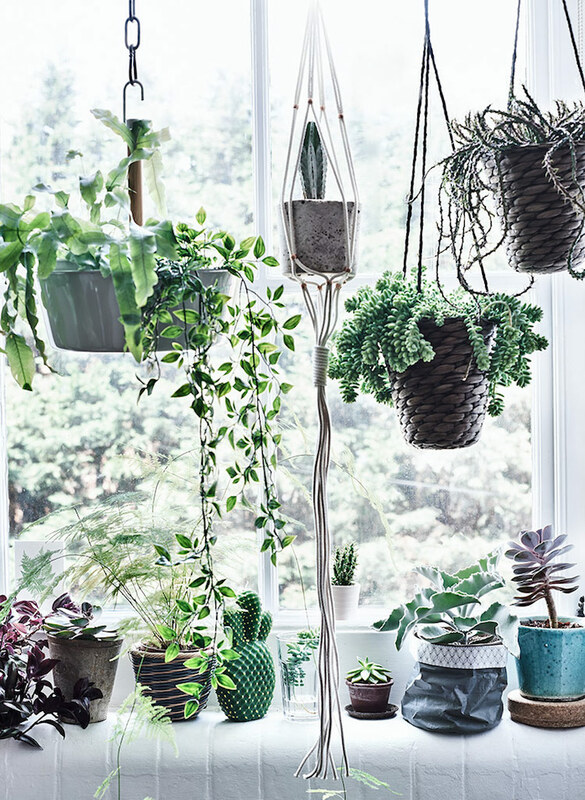 When it comes to keeping your plants healthy, Hilton advises hanging them in places you can easily get to. "The easier they are to get to, the more likely you'll keep them alive and healthy." And to water them; "take them to the shower or kitchen sink, water them and then let them drain out for about 15 minutes before putting them in back in the water," he adds. 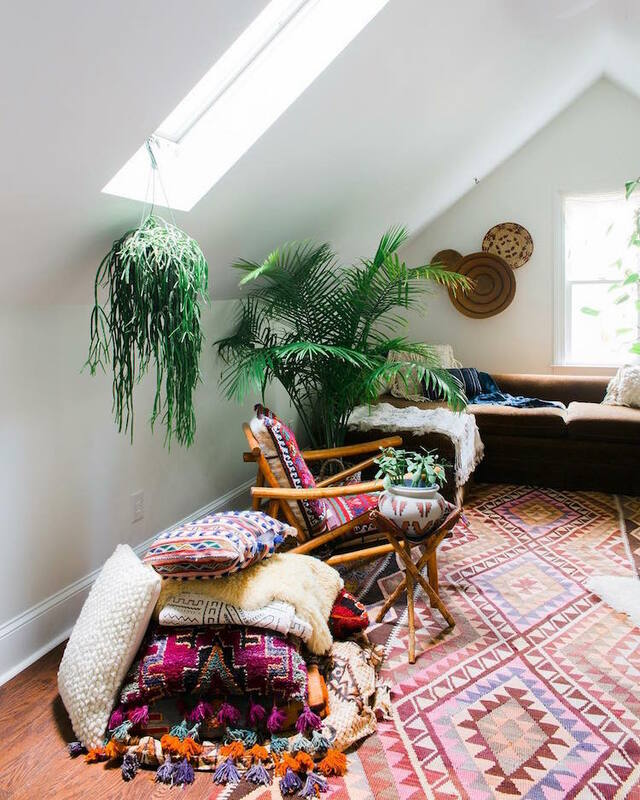 You might want to forgo the traditional hanging planter in favour of a Kokedama. Of Japanese origins, a Kokedama is a ball of soil, covered with moss from which a plant grows. Word of warning - these guys need a lot of water and a shady place. To care for them check the weight and if it feels light, it's time to submerge the ball in water. 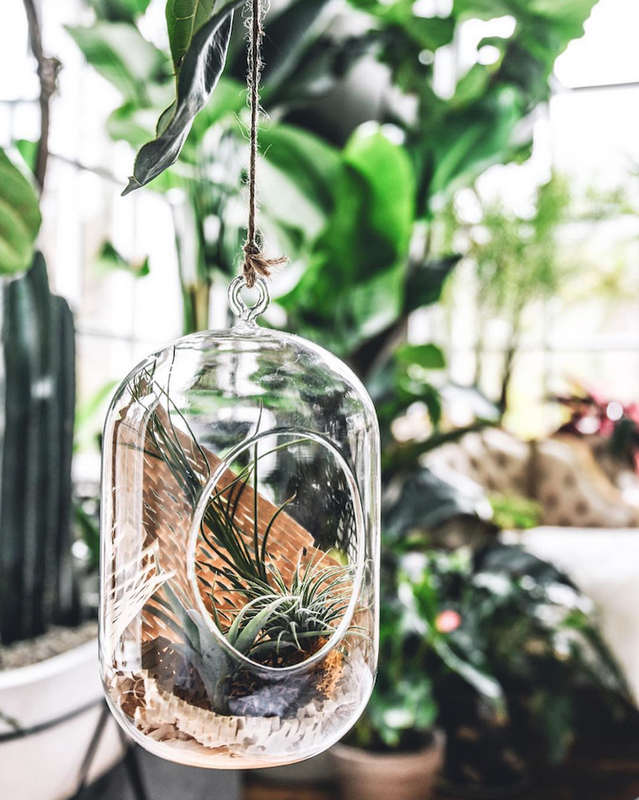 Another great option is the hanging terrarium or 'air plant' (source a similiar glass here). The beauty of these is that they are lightweight and can therefore be hung from the branches of other plants. 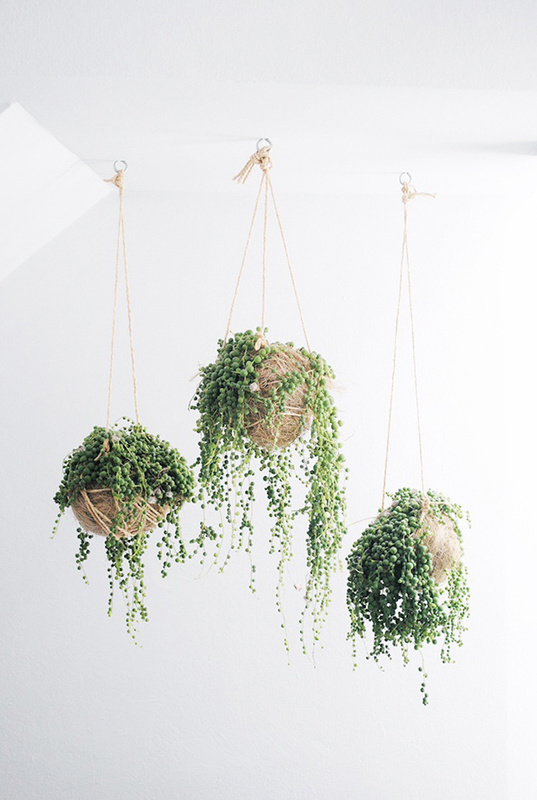 And finally, the best hanging plant for a beginner? The Artic Gardener suggests opting for a spider plant. "It's really easy to grow so if you're a newbie gardener, you should give it a go." I hope this has been helpful! I for one, feel much more equipped to create my own hanging garden. I quite fancy one over the bath! Do you have a spot in your home ready and waiting?! Researching and creating these posts always makes me feel like I don't have enough plants either Susan. Let's make it a goal for this autumn when we retreat indoors again!